When it comes to weird snacks, lots of people will think straight towards countries like Thailand, Vietnam, or China. Few people knew that countries like Russia have their own strange, sometimes mind-boggling snacks. Russia’s huge landmass provides large quantities of food production. Staple crops like wheat, rye, potato, and other fruits and vegetables are abundant, mostly during summer. There’s also another kind of products like dairies, meats, and fishes which provides Russian people with good protein. To this day, Russia had over 160 ethnic groups within its borders. From the western tip of Kaliningrad to the far eastern edge of Vladivostok, every Russian has their own ways to process and eat their foods, including snacks. Sometimes, Russian have their own creativity in processing their foods and snacks. In results, these foods sometimes make you ask “Is this even edible?” to yourself. Now, you might want to know what kind of weird snacks does Russian made. Just in case you’re about to visit Russia and found some of these snacks, so you won’t be shocked upon encountering them. Below are the lists of some weird Russian snacks that Only Made in Russia. The first weird Russian snacks are the famous black bread. When you think this bread is just an overcooked bread, you’ve got it wrong. The black color of this bread comes from its main ingredients, rye flour. Although black bread (or rye bread) are well known across Eastern Europe to the Netherlands, the Russian version has its own uniqueness. Russian black bread has more ingredients than its western counterparts (known as Pumpernickel). Basically, most black bread uses only rye flour, water, seeds, and sourdough starter. But the Russian version replaces sourdough ingredients with kefir or vinegar. Cumin and some minced meats can also be added into the dough. In results, the taste and its nutrition value are way better than Pumpernickel. When it comes to taste, black bread tastes a little bit sour and tangy. Black bread pretty much goes with most dishes in Russian cuisine. You can make buterbrod or crisps and eat them as snacks, or eat them with soup or caviar. You can also make Kvass with them. Buterbrod, or simply, bread and butter is the second weird Russian snack on this list. Some of you might think of what makes a slice of bread and butter looks weird. Well, it is not the name that makes it look weird, but the way people eats them. To make buterbrod, you simply need three kinds of ingredients: Any bread, butter, and anything you can raid from the fridge. Some Russian people are quite “adventurous”, and this doesn’t stop them from experimenting with their own foods. It is common to see people in Russia to eat buterbrod with caviar, sprats, or even a spoon of Balkan ajvar. Kholodets is a pinnacle of Babushka’s dish. Kholodets is a jelly made from animal fat (mostly pig fat). Pig feet are commonly used for making kholodets, because it gives the best gelatin to make the jelly. But any meat can be used to make it. Some people prefer fish kholodets because of its creaminess. Kholodets are very popular during winter, and commonly eaten as snacks or as a side dish. Making kholodets takes a lot of time and efforts. Russian family usually gathers in the kitchen helping their Babushkas chopping off the vegetables and shredding the meat for making kholodets. There’s a familial value that can be learned from making kholodets. Another Babushka’s dish on the list. This brown brick of mystery will surprise whoever eats this food. It is made from liver and any meats, poultries, or fishes that can be found in the fridge. It is also rich in spices because it contains bay leaf, cumin, garlic, and some other spices. There’s a lot of ways to eat pashtet. You can eat it straight away, or spread it on top of a slice of bread. It’s also can be eaten both hot and cold, but it will taste better when it’s chilled for a few days before consumption. This snack is popular among the Turkic (Kazakhs, Kyrgyz, Uzbeks, and Tatar) tribes. Back in the Soviet era, the Tatars inhabit most parts of Central Asia. Today, you can find a large group of Tatars in the region of Tatarstan, southeast of Moscow. Qazi is a sausage-like snack made mainly from horse meat filled in horse intestine. The meats are usually taken from the ribs part, and then chopped or grounded. Seasonings like nutmeg, pepper, and garlic are added to taste. The grounded meat then filled inside the intestines and then smoked or sun-dried for a week. Qazi is sliced and then boiled or fried before serving. When you are about to visit the city of Kazan or another town in the Tatarstan region, you’ll be most likely to find Qazi served in cafes and restaurants alongside other dishes. Again, some Russian snacks might deceive you when it comes to name and appearance. Salad olivye or potato salad is unlike any salad you’ve eaten before. Common salad around the world mostly consists only of vegetables and fruits, but this kind of salad is kind of weird. As the name mentioned it, the main ingredients for this salad are mashed potatoes along with carrots, cooked ham (any meat will do), peas, pickles, onions, and hard-boiled eggs. Salt, pepper, and mayonnaise (optional) then added to give more taste. All ingredients are added into the batch and mixed well. Potato salad can be eaten during all season and popular among the rich and the poor alike. Making potato salad is the best yet cheap ways to have filling snacks at the end of the month. 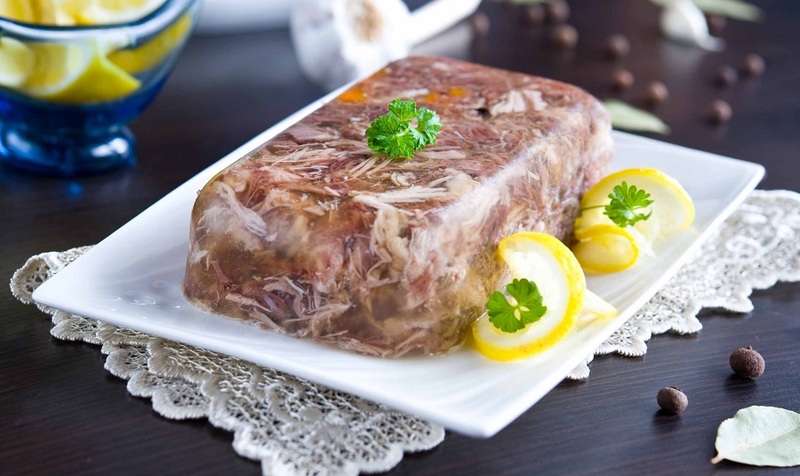 Salo is a popular traditional winter Slavic snack made from salted and dried pork fat. It is known under different names in countries across Eastern Europe. Spices like peppers and dried garlic can also be added to give taste and to help preserves salo so it could last longer. Salo has a thin to no layer of meat, so it is completely different from bacon. Salo can be eaten raw as snacks or cooked alongside other dishes such as borscht. Some people also consume salo as a hangover cure. Cvarci is a snack made from fried pig skin. The skin is cut in cube shape and the fat is melted so it’s fried in their own fat. Some milk can be added during the frying process to add some caramel color to it. Same as salo, cvarci is popular during winter time, and also can be used to cure a hangover. Cvarci are usually homemade, but sometimes can be found on farmer’s market when there’s a local home industry on the area. There you go, eight weird snacks that can be found in Russia. Feel free to buy or make some of these snacks at home! Make sure you’ve tasted these snacks at least once in your lifetime. Despite their weird name and looking, its taste will never be disappointing.